Maushop Beach Cottage- New Seabury, Steps To Private Beach! Gorgeous private Maushop Village Beach on Nantucket Sound! Welcome to the light and airy open floor plan of our getaway! The kitchen was designed to maximize space & includes a W/D. The living area is light filled & provides access the rear patio. And a private renovated bath with a walk-in tiled shower. The main-floor bedroom offers 2 twin beds. The 1st floor renovated full bathroom with tiled tub/shower. Exterior view of our delightful attached 2-story beach cottage. Enjoy morning coffee, outdoor dining or as a spot to just relax. The rear fenced brick patio is a great conversation spot! Beautiful views from the bluff above Maushop Beach and beyond! Take a stroll on the wooded path to the Popponesset Marketplace. Come make wonderful memories at Maushop Village Beach! 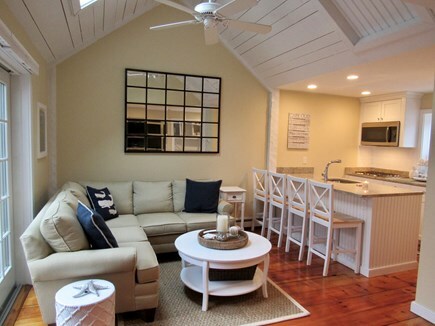 Discover our delightful two-story cottage with stylish coastal decor. This thoughtfully appointed, attached beach cottage is located in Maushop Village, a casual and relaxing waterfront community with quaint Nantucket-style architecture, white picket fencing, and lush seaside landscaping. Located in New Seabury Resort, Maushop Village is set on a bluff above the sandy beach and lapping waters of Nantucket Sound. 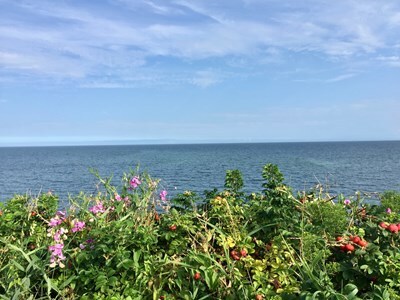 We have spent many years vacationing in this beautiful coastal community, and we are thrilled to help other families and friends make lifelong memories vacationing on Cape Cod by sharing our home with them. The recently remodeled living area, was redesigned along with the kitchen to create an open floor plan and adds a sense of coastal airiness. A skylight and a wall of sliding doors provide abundant natural light, and wide pine flooring adds traditional charm. Relax in the living area, where a white shiplap cathedral ceiling, custom built-in’s and coastal furnishings evoke a classic cottage vibe. 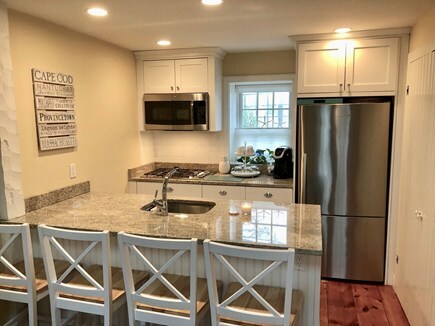 The newly renovated kitchen was designed to maximize its space and includes granite counters, custom cabinetry, stainless appliances and a washer/dryer. Before you head to the beach, enjoy morning meals at the breakfast bar for four. Find total serenity in the private master suite, located on the second floor, featuring a cathedral ceiling with skylights and a ceiling fan. Unwind in a queen-size bed and refresh in a beautifully renovated full bath with a walk-in tiled shower. A second bedroom offering two twin beds is located on the main level, as is a second renovated full bath with a tiled tub/shower combination. The front and rear patios are wonderful for enjoying a coastal breeze. Indulge in alfresco summer meals on a front patio with shaded dining table and Weber grill—a privacy trellis adds a sense of seclusion. Sip morning coffee or happy hour cocktails on a rear patio off the living room, furnished to provide a quaint conversation space. 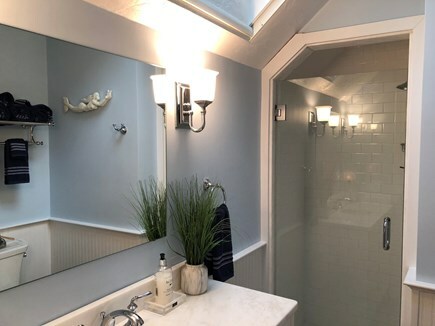 If you are looking for a little privacy, yet still be just steps away from the beach and Popponesset Marketplace, this is the perfect location…We especially enjoy having the best of both worlds! From our cottage, you can walk just 3 minutes to private, deeded Maushop Village beach to splash in the waves or work on your suntan. Or stroll 5 minutes down a wooded path to family friendly, Popponesset Marketplace, a beloved local spot home to boutique shopping, cafes and eateries, coffee and ice cream shops, bike and water sport rentals, mini golf, and the Sounds of the Summer concert series for all-ages. Ready to explore further? Drive just 10 minutes to Mashpee Commons for grocery and outdoor shopping, boutiques, a variety of local small businesses, restaurants, movie theater, bowling, and a popular seasonal farmer’s market—all in a charming New England village setting. New Seabury is a prime location to stay for the quintessential Cape Cod experience. Go whale watching, visit Cape Cod National Seashore, sip reds and whites at local wineries, tour the lighthouses, or even catch a Cape Cod Baseball league game to enjoy a great American pastime. From here, beloved New England Island destinations are within easy reach. Hop on a nearby ferry from Hyannis or Falmouth’s Woods Hole for a day trip to Nantucket or Martha’s Vineyard. We hope you enjoy your stay! Additional pricing info: Cleaning $150, Refundable damage deposit $500.00, Repeat guest discount! **New Tax for 2019**, State and local taxes of 12.45% will apply. This is the most charming cottage just a few houses from the dune steps. The owners have furnished it impeccably with beautiful linens, towels, fully equipped kitchen and welcoming bath amenities. The entire house house has beautiful and modern finishes and is a perfect vacation spot for a small family. Tom and I were so happy that you enjoyed your stay at our cottage. We were thrilled to host you for your family reunion at New Seabury Resort!. Thank you for all of the wonderful compliments. it means so much to us to know that you were happy. We just spent a week in a perfect cottage close to the ocean. The beautifully decorated cottage was not just comfortable but had every amenity. A short walk to the beach was all we needed to relax. The area has a wide variety of fun spots, shops and restaurants. The homeowners were a pleasure to deal with. We will definitely be back! Thank you very much for your lovely review. Your kind words are very much appreciated. It makes us so happy to hear that you enjoyed our Maushop Village Beach so much and that you had everything you needed to make your stay so relaxing. We hope you will come back again next summer! It was our pleasure to host you. We absolutely LOVED our stay at Tom & Sherry's beautiful home in New Seabury. The entire gated community is safe, family-friendly, clean and BEAUTIFUL! Poppy Market is so easily accessible (walking distance) from the home and it's a fun option for dining, shopping, ice cream and mini golf. The private beach is only a few minutes away, either via stairs or a sloped walkway, if you choose to bring a wagon like we did most days. Thank you very much for your wonderful review! Your compliments about the cottage and Maushop Village are greatly appreciated. The walkability to the beach and Popponesset Marketplace is the best for families like yours. It makes us so happy to hear that you truly enjoyed your stay. We would be delighted to host your sweet family again next summer. We are newer owners here at Maushop Village. We purchased our property in December, 2017 and were thrilled to offer our home away from home for its “Maiden Voyage” as a summer vacation rental in 2018. Although we may be new owners here in Maushop Village, we have many years of experience as vacation rental guests ourselves. It is our pleasure to make your vacation stay experience comfortable, relaxing and memorable. We loved our first experience hosting guests and look forward to the 2019 season! The moment we walked into the our two level attached Cottage we knew it was the one for us. Recently updated, remodeled and renovated made it an easy decision for us. The open floor design of the living area and kitchen make it bright and airy! The location is just what we were looking for... a bit of a private feeling, which we love. The deeded private Maushop Beach is just steps away. We have made many years (maybe 20) of wonderful memories vacationing at Maushop Village with our children and we plan to continue the tradition with our granddaughter. We hope you make wonderful memories here too! Maushop Village is a private beach community situated in New Seabury Resort, on Cape Cod in Mashpee, Massachusetts. New Seabury Resort is a charming seaside community set amidst a country club setting. 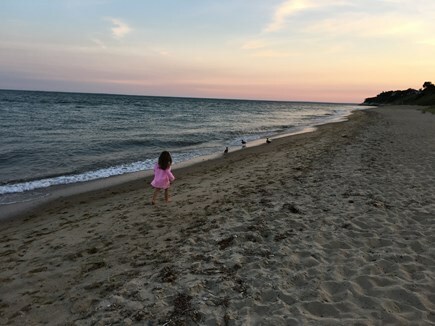 Maushop Village offers a deeded private beach on Nantucket Sound to its owners and their guests only. Take a 5-minute walk to the much admired Popponesset Marketplace for boutique shopping, eateries and live entertainment. Bike, walk or jog the trails throughout New Seabury.